On Saturday April 6th, 2019, The Prince Edward Island Dental Hygienists’ Association will be once again be participating in Gift from the Heart. The Gift from the Heart is a day set aside for registered dental hygienists from all across Canada to open their heart and share their skills and knowledge with those who need it the most. This national one-day event allows registered dental hygienists to give back to the community by providing no cost dental hygiene care to those who experience financial barriers to accessing preventive oral care. Holland College has granted us use of their dental clinic facility to host this event. To enable this event to be a success dental hygiene volunteers are needed. Last year, thanks to dental hygienists volunteering Gift From the Heart provided care to approximately 70 individuals. Volunteer shifts are broken down into 2 hour time slots. Thank you for agreeing to participate in this worthwhile community project, and for your continued support of our local dental hygiene Association. 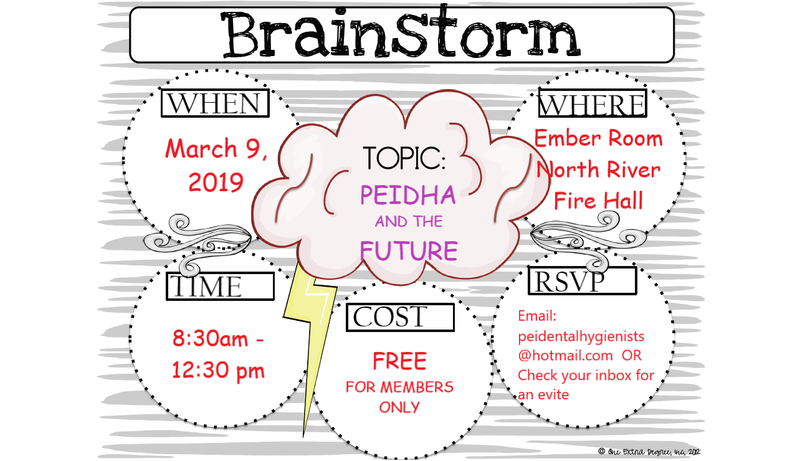 A BRAINSTORMING event with the PEIDHA council and PEIDHA members to work with our consultant Vicki Bryanton and guide our profession into the future. Snacks will be provided. This is for PEIDHA/CDHA members only and there is no cost. That's right...4 FREE CE POINTS! Have you ever wondered what your professional practice insurance considers following practice standards? If you had to make a claim, would you be covered? Do your continuing education choices tend to be based on what is conveniently available? Would you like to make your education choices based on the best options for you in your professional practice? 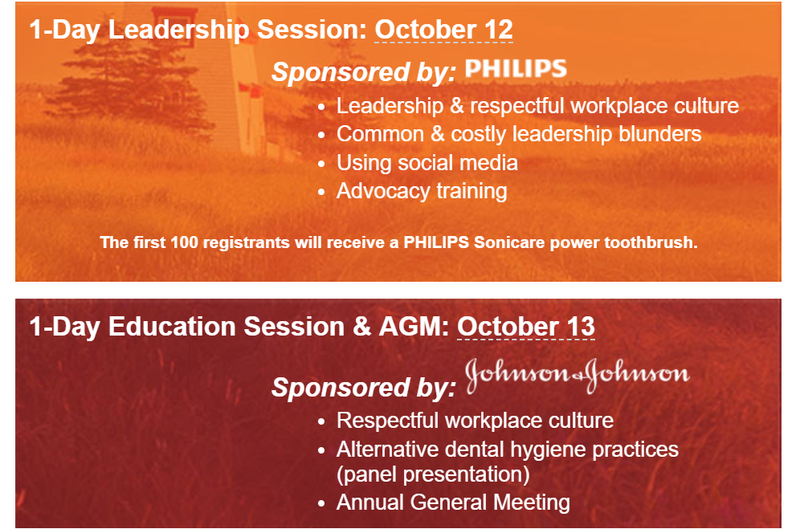 Join your colleagues for this professional development session where the practical application of dental hygiene standards will be discussed. The PEIDHA Council has developed draft practice standards to advance the profession in PEI. We are looking for your feedback on any concerns you may have about these standards as they are applied in PEI. We also hope that the written standards will help you to be proud of your profession and the work it represents. We look forward to getting together with everyone. 9:00-10:30am – Karen Campbell, Q.C. The seminar will focus on helping employers to navigate the impact of cannabis in the workplace. It will examine the key differences in the legislative regimes for medical and recreational cannabis use, as well as, discuss some of the potential effects both may have on workplaces. The seminar will also address the main components of workplace policies dealing with cannabis, the challenge of detecting cannabis impairment, appropriate discipline, and when the employer’s duty to accommodate medical cannabis use is triggered. Cannabis beneficial effects have been observed in a large range of indications, such as muscle relaxation, rheumatic and chronic pains, anxiety, depression, loss of appetite, childhood-onset epilepsy and chemotherapy-induced vomiting and nausea. However, cannabinoid-based medicines are still not appropriately integrated into clinical practice due to a lack of evidence on safety, efficacy and administration instructions. Tetra Bio-Pharma has developed several formulations of Cannabis and is currently running preclinical and clinical trials to collect high-quality data on cannabinoid-based medicines. Tetra Bio-Pharma will present the safety and pharmacokinetics data of inhaled cannabis and cannabis oil collected in Health Canada-approved phase I studies. An overview of on-going phases II and III clinical trials with different formulations of cannabis will be presented too. The clinical studies will highlight the complexity of cannabis treatment, related to the targeted patient population and the complexity of the dosage and formulation to treat a particular health condition. Dental Considerations related to Cannabis: implications for dental practice. In terms of my own expertise I have worked in a public setting for over 30 years. I worked with many individuals who have both social, mental health and substance use issues. This is part of my daily practice. What does cannabis use in Canada look like today? What should I understand as a dentist about that? Disclosure – updating medical history and discussions to include questions related to cannabis. Prescribing verses authorization: how is legalization going to change? Oral health impacts of cannabis – what do we see in long term use and smoking? Tobacco smoking, cannabis and now nicotine vaping solutions: new ball game. Common scenarios: how to have a conversation with patients about cannabis use and its potential impact for them – safer alternatives? Making sure we provide care safely. It is with great pleasure that we extend you an invitation to attend the Scleroderma Education Forum taking place on November 24, 2018 at the Four Points by Sheraton, Halifax, NS. Scleroderma Canada’s Education Forum is an opportunity for those living with this rare auto-immune disease; their families; clinicians; and other stakeholders who share an interest in systemic sclerosis to come together in an interactive format. An expert panel will provide a wealth of information on a wide variety of topics. Presenters will include Dr. Evelyn Sutton, Rheumatologist, who will speak to the manifestations of scleroderma; Dr. Brett Thombs of SPIN will share information regarding online support tools; Dr. Murray Baron of the CSRG will discuss stem cell transplantation; and more. Following the panel, there will be a question & answer session with the forum audience. As a health-related organization with ties to the scleroderma community, we believe you will find tremendous value in the conversations that will take place at this event. Should you have any questions, please contact us at info@sclerodermanovascotia.ca. We look forward to welcoming you on November 24th. PEIDHA Member Early bird rate of $25.00. Non-member early bird registration $40.00. To guarantee this rate payment must be received in full on or before April 28, 2018 . All registrations received after April 28, 2018 will cost $50.00. Please use “dental” as the answer to the security question “What is my profession”. Melissa is the Research Coordinator for the CSHR Group. She is responsible for leading all data collection and knowledge exchange activities for the SHAPES-PEI and CSTADS studies, while also providing overall administrative support and staff supervision in the CSHR research office. Melissa is an active member of the PEI Tobacco Reduction Alliance (PETRA); she is the research representative on PETRA's steering committee and sits on the organization's "Youth Prevention" working group. As a social worker, Melissa is passionate about health equity and applying a social justice lens to public health promotion, research, and community engagement. PEIDHA is pleased to participate once again in this great cause. Volunteers will perform free treatment to anyone in need in PEI. In 2017, we were able to treat over 70 individuals and expect another larger turn out this year. We are the only PEI location for his event. Please volunteer. Value of 2 CE points for one shift or 4 for a half day.